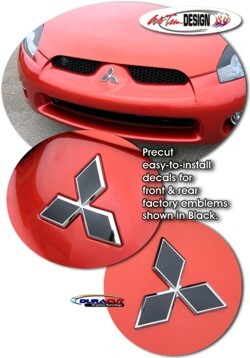 Dress up your 2000-Current Mitsubishi Eclipse's front & rear factory emblems with this decal set. The precut easy-to-install decals are perfectly fit to install over the diamond centers of the existing factory emblems. They are uniquely designed so that the existing chrome slightly outlines the decal as shown in the image. Available in a wide variety of colors (shown in Black), all of our graphics/decals are manufactured from Premium grade vinyl materials.